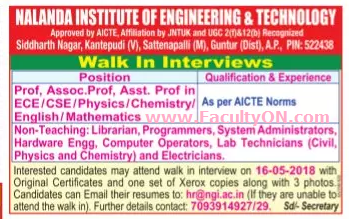 Nalanda Institute of Engineering and Technology, Guntur has advertised in the SAKSHI newspaper for recruitment of Professor / Associate Professor / Assistant Professor Plus Non-Faculty jobs vacancies. Interested and eligible job aspirants are requested to walk-in on 16th May 2018. Check out further more details below. About College: Nalanda Institute of Engineering and Technology, is located 26 km from guntur city on Guntur- Hyderabad National High-Way, with all convenient facilities to travel from different locations within the district. The college is approved by AICTE-New Delhi and Affiliated to Jawaharlal Nehru Technical University-Kakinada, AP, India. The College has a picturesque, spreading campus, about 40 acres. How to Apply: Interested and eligible candidates are requested to attend the Walk-in interview along with all originals & copies of certificates / testimonials and 03 recent PP size photos to the walk-in address provided here. Candidates can send applications through email if they are not able to attend the walk-in.